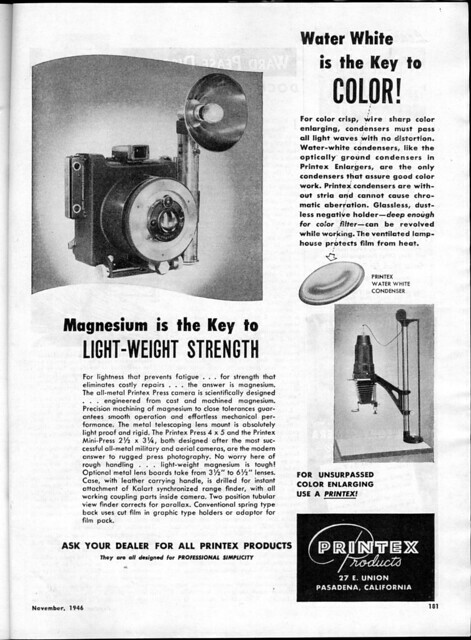 The Printex Press was a camera made in Pasadena, California, by enlarger manufacturer Printex. The standard model was a 4×5" camera, while a Mini-Press 2¼×3¼" was also offered. The 4×5" model had a 6½ inch f/4.5 lens in a shutter marked Ilex No.3 Acme. In contrast to the typical Graflex Speed Graphic style of press camera with a lens extending on bellows, the entire camera is a rigid magnesium casting; the lens is mounted on an oversized telescoping tube. A Kalart Synchronized Range Finder was typically included. It is not a common camera, and it is unclear how many were sold. Printex Press at Oddity Cameras, at Novacon, Brazil. This page was last edited on 15 May 2016, at 04:07.